1. Unplug appliances, chargers and turn off any lights that aren’t in use. Make the most of natural light during the day by letting the sunshine in through windows. At night, be sure to turn the computer all the way off instead of simply logging out. By taking a few extra minutes a day, we can help save our outdoor friends like Mub and Grub. 2. The Leafmen travel by hummingbird, producing no environmentally harmful waste. It may be pretty impossible for people our size to get from place to place on a bird, but there are other ways to be green such as sharing a ride with friends or family will significantly decrease the pollution in our air. 3. The Leafmen use their surroundings to create stylish armor. Although we may not realize it, even clothing can have an impact on the environment. Washing clothes uses tons of water and energy. Try to put off this chore as long as possible and only do laundry on cold cycles and when you have large loads. Take good care of clothes so that you don’t have to buy new ones as often. 4. You can create your own personal, beautiful Moonhaven right outside the back door by creating a garden full of flowers, herbs, vegetables and fruits. This will have a fantastic impact on our backyard as well as the rest of the world. Buying local instead of buying goods that have been transported long distances will help us reduce harmful toxins in our atmosphere. 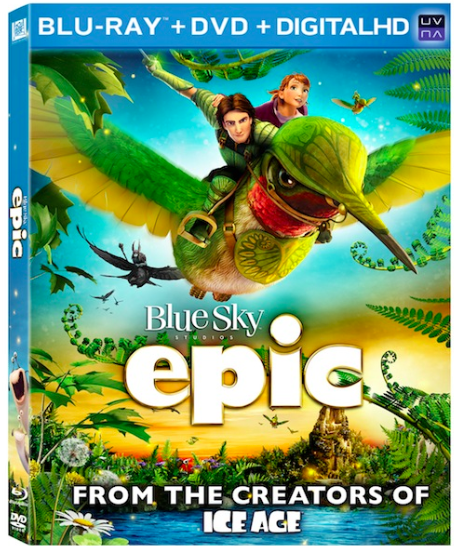 Win a copy of the EPIC blu-ray or DVD before September 5th. This giveaway is open to everyone in US and Canada. Please enter through the rafflecopter below and follow all my social media networks to win. I recycle and turn off lights when we don't need them!!! I am in Canada and my kids have yet to see this one. They'd love it. We try simple things like turning lights off when we eave a room. It's a constant battle though. We're in Canada. We try to be green with most things, lower heat temp in winter/higher in summer for a/c. DH rides his bicycle to work year round and we walk to school most days. I live in Canada. We recycle and try and reduce the amount of garbage we have by not buying things with lots of packaging. I"m in Canada. We are green by recycling everything that can possibly be recycled, we use cold water for washing, we use friendly soaps, we use cloth bags for grocery shopping, we turn off lights when leaving rooms...we try to do everything that we can. I'm in Ontario...we recycle in the blue bin as much as we can, use our green bin religiously for compostable products, carpool as much as we can, turn the thermostat up in the summer and down in the winter and turn lights off when we're not in a room/don't need them. I live in canada and we practice the 3R's and buy second hand whenever possible! I'm from the US. We are using more green cleaning products. I live in Alberta Canada and we try to save energy, recycle, and reduce. I am in Ontario, Canada and we try to be green by re-using shopping bags and recycling whenever possible. I am in Canada. We recycle and ensure lights are off when we are not in rooms/around. I live in Canada and I definitely try to be green. We recycle and try to walk or talk the bus rather than drive a lot. I live in the US. I try to be green by recycling, making sure to not waste energy, water, etc. US. I recycle, dry my clothes outside, walk/bike instead of drive. i live in Ottawa Ontario, Canada and oh yes I am a green person, my kids are so confused as to what to keep and what goes in recycle. I live in Canada. I try to be green by doing things like recycling, composting, buying second-hand clothing, borrowing books from the library rather than buying them, and shopping at my local farmer's market. I live in the US. And we have been recycling everything for years now. I live in the US and always recycle and re use what I can! I live in Canada and recycle. I live in Alberta, Canada. We recycle everything we can, bottles, plastic, cardboard, paper & compost. Canada, and we try to conserve hydro as well as shop locally and recycle. I'm Canadian. We're green by recycling and reusing as much as possible. I am Canadian. We are big on recycling and repurposing as well as composting and growing our own garden. I'm Canadian and we reduce, reuse, recycle! I'm Canadian. We recycle, have litterless lunches, compost, and have a vegetable garden. I`m in Canada. I try to recycle and reuse whenever possible. I'm in Canada. I recycle everything I can; even bring it home from camping and vacation spots if they don't have recycling available! I am in the U.S. We do try to been as green as we can. We recycle and we conserve as much as possible. I'm in Canada and we try to be green by composting, recycling and reusing whenever we can. I'm from Ontario and we try and reuse of recycle as much as we can. I live in the US and try to recycle as much as possible. From NL. I recycle, hang clothes outside to dry in the spring to the fall. I walk to the store for I need just a small item. I'm Canadian> We recycle, use cloth diapers, use reusable bags, turn off lights, have shorter showers etc. I'm canadian and we upcycle whatever we can with our kids things and household items, and recycle the rest. i'm canadian and we upcycle whatever is possible and recycle the rest. I am in Canada. We try to be green by recycling and reusing! I live in Toronto and recycle EVERYTHING I can! Tried to be more green by composting non-stinky things like coffee grounds and egg shells, in order to use them in the garden. I'm in Canada. We recycle and try to be energy efficient wherever we can.